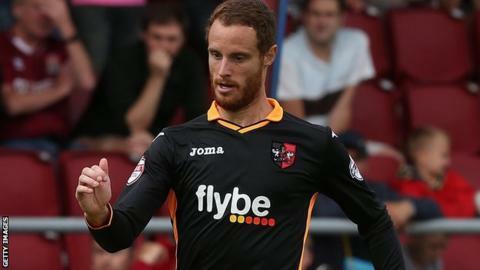 Exeter City manager Paul Tisdale hopes a number of his more experienced players will return to fitness soon. Ryan Harley played for just the second time since the middle of September in City's 1-1 draw with Notts County. Troy Brown, Matt Oakley and Alex Nicholls are among the players still missing from the Grecians squad. "Hopefully one or two more players will come back in over the next week or two and we'll start to see some more strength in the squad," Tisdale said. Harley played for the final seven minutes after coming on as a substitute. "It's really good," Tisdale told BBC Radio Devon. "He's been out for six weeks. I know he had a performance at Plymouth in the Johnstone's Paint Trophy, but maybe he wasn't quite ready so maybe we'll go back at it a little bit steadily this time. "It was nice to see him out there, he's got control of the ball and brings some of the others to life around him and you could see that in that last 10 minutes."